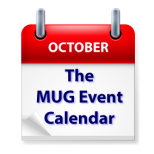 Trick or treat seems to be slowing The MUG Event Calendar this week. A Florida group will look at Pages, an Ohio group will review 3D printing, and a California group will get in-depth on Yoesmite. A number of other groups are meeting this week, but are playing to close to the vest, so you’ll have to visit them to see what treats they are offering.